Many homes and businesses have felt the impact and additional burden of increased load shedding. The Cape Town CBD and surrounding areas have been excluded from load shedding due to “the sheer volume of the population”, as stated by a member of the mayoral committee for Energy and Climate change, giving a slight reprieve for now, in the interest of public safety. Zonnebloem, University Estate, Walmer Estate, Woodstock and Salt River are unfortunately not exempt. CBAR has implemented additional measures quite some time ago to deal with abnormally high levels of alarm activations that will certainly have an effect on the Central Monitoring Centre (CMC) during load shedding. Both the duration taken to call back clients as well as response times due to high volumes of signals received will increase. CBAR will prioritise load shedding areas as these areas become more vulnerable to criminals during these outages. Criminals will take advantage of the dark areas and by studying load shedding time tables, they will know when and where to increase their activity. In response CBAR will rotate our assets on the road to match areas with power outages. What happens to your alarm during load shedding? Your alarm system is powered by a 12v battery contained in the control panel housing. It is charged via a charger board, which in turn is charged by a transformer, which is plugged into an electrical socket. The battery backup is not designed to be used on an ongoing basis, especially for a week at a time, 2/3 times a day for 2.5 hours as recently experienced. This will definitely have a detrimental effect on the battery and shorten its lifespan. The battery requires approximately 4 hours to recharge itself provided that it is good condition. If your control panel goes blank during load shedding, it means your battery needs replacing. Your alarm system, including panic buttons will not work. The greater number of zones on the alarm system, the quicker the battery backup will become depleted. Between 4-6 hours on a system using up to 8 zones; 8-16 zone alarms, takes 3-4 hours and up to and beyond 32 zones possibly 3 hours backup time. If your current system is using more than 16 zones, especially if the majority of the zones comprise of motion detectors, it is advisable to install a power pack. Your system should “beep” continuously whilst displaying a trouble light / symbol on the keypad before it completely shuts down. If your battery backup is in good condition, it will start to re-charge once the power to the system has been restored, again taking approximately 4 hours. Wireless systems do use less power and are able to last up to 6 hours. Note: Power surges caused by unprecedented levels of load shedding, may result in the alarm panel blowing. Your alarm system is made of electronic components and may at any time cease to work. It is advisable to have some surge protection installed, even the use of surge protection plugs are advised. Other electrical appliances such as televisions, decoders and fridges may be affected by the power surges. Older alarms and transformers have no element of surge protection. Alarm systems should ideally have dual monitoring which means that the alarm signal is transmitted to the CMC via either radio transmitter, GPRS radio or telephone. Just using telephone monitoring is not an adequate medium for alarm monitoring, and a radio transmitter should be linked to the alarm. Telkom lines may fail during load shedding. What happens in our CMC when there is load shedding? Our CMC has the required backup systems that are implemented to ensure a smooth switch over from one facility to another in the event of an interruption of power supply. Your alarm system sends a multitude of additional signals to the CMC. During load shedding, your alarm will firstly generate an AC fail signal, defaulted to be sent through 20 – 30 minutes later, after the power has failed, telling our staff that there is a power failure on your system. This delay is set in case the alarm is mistakenly unplugged for some reason. The low battery signal thereafter generally indicates that your battery is about to fail. Our CMC should get the low battery signal, and provided that the alarm system programming is correct, will call you advising you of the trouble condition. Please be advised that if an entire area is affected, it is not possible to call all the clients as it would be an almost impossible task whilst still dealing with the standard burglary, panic, 24 hour test and opening and closing signals. CBAR has standby technicians available 24 hours a day. After hours call out rates are charged after 5pm on weekdays and over weekends and public holidays. There could be a significant delay in getting a technician to attend to your alarm fault due to logistical reasons during load shedding. Our CMC is contactable on 0860 151515 all hours. Load shedding schedules are printed in various newspapers and also available on the app “EskomSePush”- (one word) so don’t get caught out. Keep your vehicles fuel topped up as certain petrol stations can’t operate during load shedding. Similarly, it is advisable to keep some cash on hand in the event ATM’s are non-functional. Keep all cell phones, rechargeable torches and laptops fully charged as far as possible. As mentioned before, ensure your alarm systems battery backup / power packs are in good condition so that your alarm system remains functional. If finances allow, invest in a generator to run certain appliances and always keep spare fuel stored in a safe, cool, dry place. A few good quality torches and spare batteries placed at a specific point in the home are a must. Rechargeable lights are inexpensive and very useful. If you are cooking and the power goes off, do not forget that once the power comes on again, the appliance will again heat up and could be a fire hazard should you have gone to bed or left the premises before the power is restored. Check all gates and garage doors are locked and if possible, put a chain and lock on the driveway gate as a further level of security. Keep a supply of bottled water, some non-perishable food stuffs, pet food, medication, toiletries, first aid supplies etc. for just in case. As we have been experiencing load shedding in the summer months over weekends when the demand is at its lowest, the possibility EXISTS that during the winter months even further strain may be placed on the electricity grid. 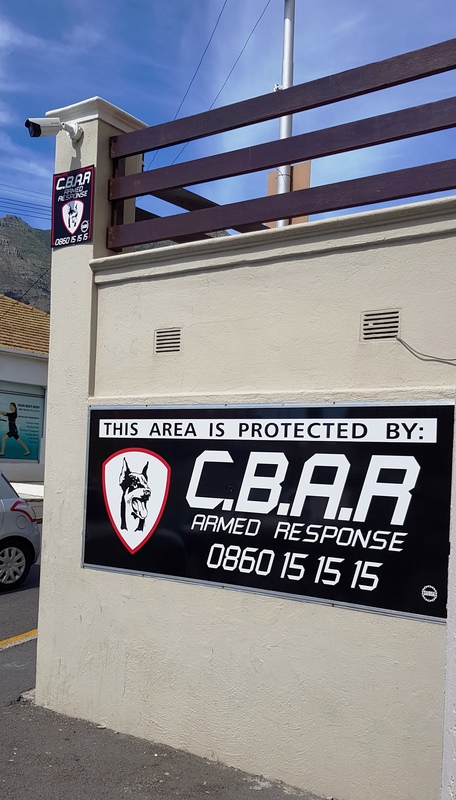 LPR Camera: CBAR has sponsored an LPR camera at a strategic position outside our offices monitoring Upper Buitenkant Street. Some Recent Arrests – WELL DONE TEAM! Whilst on patrol in Upper Union Street, on Thursday 19 February, ARO Selwyn Jonas spotted a suspect with stolen good removed from a car break-in. Suspect was arrested and handed over to SAPS. On 15th March at 01:46, whilst on patrol, ARO Selwyn Jonas spotted a suspicious person with 2 black bags. When questioned, the suspect was found to have 2 stolen bags of clothing and an iPad. The suspect was arrested and handed over to SAPS. On 12th February at 11:55, whilst on patrol in Fairview Avenue Woodstock, ARO Simon Mhlanga spotted 2 male suspects breaking into a premises. The burglar bars had already been broken off the wall. 1 suspect was arrested for house breaking and the other fled the scene. The suspect was handed over to SAPS. On 23rd March at 09:46, CBAR received a panic alarm from a client in Trek Road who spotted a suspect breaking into his home. ARO Theo Tungani, closely followed by ARO Selwyn Jonas, responded to the panic and arrested the suspect, who was then handed over to SAPS. For all security / medical and general assistance. VISIT our web-site on www.cbar.co.za for all our stats.